In the beginning, the research was primitive. 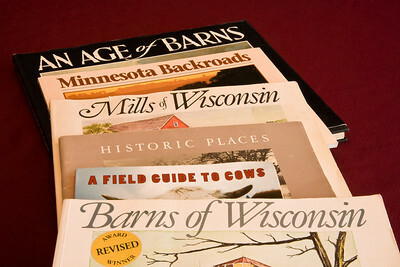 We had acquired a couple of books written by a local author about barns and mills located right here in Wisconsin. The descriptive writing and beautiful illustrations tempted us to try to find them. So we scribbled little notes in the margins of our gazetteer and headed out on the backroads. We found some of them, but there were many that we couldn't find due to limited information on the exact locations. After several attempts, we realized that we could find interesting rural architecture to photograph just by exploring the backroads on our own. Back then our backroads adventures were only occasional, so our photo collection was limited. And our memories were good, so it didn't seem necessary to take notes about where each photograph was taken. Then Joann found a listing of Round Barns of Vernon County, Wisconsin, and I marked all of the round barns from their descriptions. Next came marking old mills from a list I bought when I joined The Society for the Preservation of Old Mills (SPOOM). 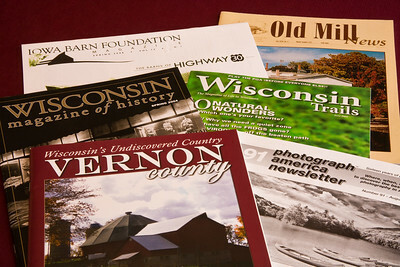 More library research turned up a listing of all of the round barns that had existed in Wisconsin in the 1970's. Our list of locations to investigate began to grow. As more information became available on the Internet, I began exploring historic websites and adding to our list of locations to visit. Often hours pass by while I sit at the computer pouring over websites and following links from one site to the next. 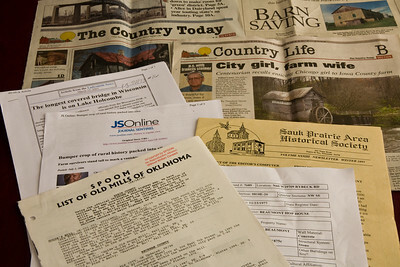 Websites, newspapers, magazines, and books are all sources of more possible photo opportunities. I now gather information for all states in preparation for our photography vacations. Planning those trips takes months of time, but it is so rewarding when we come home with thousands of photos of things we might have missed without the preparation. 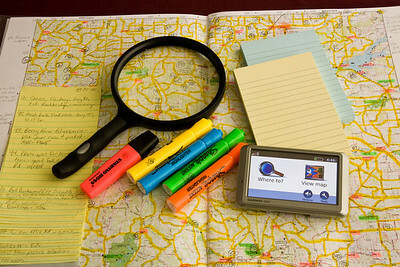 Our method of recording photo opportunities evolved from writing the descriptions and locations in the margins of our gazetteers to large post-it notes stuck to the map pages to large notebooks filled with information for the various state gazetteers. I spend hours searching for road names on the gazetteer pages so I can locate things I discovered in my research. And now that our backroads adventures are frequent, our passion intense, and our memories are not what they used to be, I am diligent in recording information about every photograph taken. 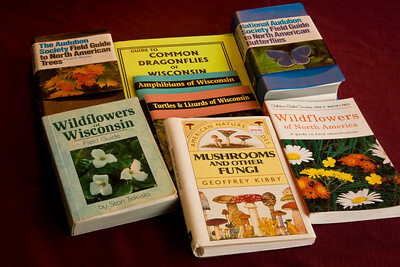 While Joann studies a photographic subject for the best composition or a unique perspective, I am usually back at the car studying -- scouring reference books or searching the Internet for information on the subject (for example, type of barn, wildflower, butterfly, etc.). We used to joke about how we needed a side car to transport our "library" of books and reference materials that we always brought with us on the road. Researching in the car has become easier with my Kindle and my Smartphone. But sometimes there is no signal or no online version of a good book, so we still carry some along. After I find what I need about a particular subject, I then start figuring out what we'll photograph next and how we'll get there. After all, the fun is in the journey!